"Big Wall Street banks are so upset with U.S. Democratic Senator Elizabeth Warren's call for them to be broken up that some have discussed withholding campaign donations to Senate Democrats in symbolic protest, sources familiar with the discussions said. 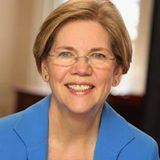 "Citigroup has decided to withhold donations for now to the Democratic Senatorial Campaign Committee over concerns that Senate Democrats could give Warren and lawmakers who share her views more power, sources inside the bank told Reuters. "JPMorgan representatives have met Democratic Party officials to emphasize the connection between its annual contribution and the need for a friendlier attitude toward the banks, a source familiar with JPMorgan's donations said." That's right, the biggest banks on Wall Street have made it clear that they expect a return on their investment in Washington. Forget making the markets safer (where they can still make plenty of money) and forget the $700 billion taxpayer bailout that saved them and forget the need to build a strong economy for all Americans. Forget it all. The big banks want a Washington that works only for them and that puts their interests first -- and they would like to get a little public fanny-kissing for their money too. Well forget it. They can threaten or bully or say whatever they want, but we aren't going to change our game plan. We do, however, need to respond. According to this breaking news, our 2016 Democratic Senate candidates could lose at least $30,000 because of this decision. Can you help us raise $30,000 to match Wall Street's money right now -- and keep fighting for a Democratic Senate that will work for people instead of big banks? Now let's be clear: $30,000 is a drop in the bucket to JPMorgan and Citigroup. Heck, JPMorgan CEO Jamie Dimon makes more than $30,000 in just a few hours. That kind of swagger is a warning shot. They want a showy way to tell Democrats across the country to be scared of speaking out, to be timid about standing up, and to stay away from fighting for what's right. I'm not going to stop talking about the unprecedented grasp that Citigroup has on our government's economic policymaking apparatus. I'm not going to stop talking about the settlement agreements that JPMorgan makes with our Justice Department that are so weak, the bank celebrates by giving their executives a raise. And I'm not going to pretend the work of financial reform is done, when the so-called "too big to fail" banks are even bigger now than they were in 2008. The big banks have issued a threat, and it's up to us to fight back. It's up to us to fight back against a financial system that allows those who broke our economy to emerge from a crisis in record-setting shape while ordinary Americans continue to struggle. It's up to us to fight back against a regulatory system that is so besieged by lobbyists -- and their friends in Congress -- that our regulators forget who they're working for. Let's send the biggest banks on Wall Street our own message: We're going to keep fighting, and your swagger and your threats won't stop us. Help us match their $30,000 right now.